David L. Amsbury lived a diverse geologic career, always seeking to understand how sedimentary rocks, especially carbonate rocks, were deposited. He relished sharing his experience with geologists and non-geologists alike. He was a long-time member of SEPM (Society for Sedimentary Geology), a charter member of the Gulf Coast Section of SEPM, a Fellow in the Geological Society of America, a member of the Houston and South Texas Geological Societies, and a member of the Society of Sigma Xi. David was born in Topeka, Kansas on December 30, 1932 to Leonard and Annette Amsbury. In 1952 he earned the B.S. degree in geology from Sul Ross University in Alpine, Texas, and in 1957 was the youngest Ph.D. in geology at the University of Texas at Austin. The first ten years of Dave's career were with Shell Development Company under the guidance of Dr. Frank Lozo investigating Lower Cretaceous carbonates in Central Texas as a model of Cretaceous reservoirs worldwide. In 1967 he was given an opportunity to join NASA in Earth Resources to use remote sensing to reveal planetary surficial processes. He instructed many astronauts on how to photograph the Earth's surface to enhance its fine features. Geology students now use these photos to learn about geomorphic processes. One of Dave's achievements at NASA was winning a hard-fought battle to put a viewing portal in the space station, which originally was designed without a window. In 1998, Dave and his wife, Ann Long, retired from NASA and Houston to enjoy life in the Texas Hill Country near Kerrville. Dr. Amsbury's contributions have been recognized by the Distinguished Alumni Award from Sul Ross University in 1999 and the NASA National Team Award in 2002 for his work on the science window in the International Space Station. Dave influenced many students while teaching geology at the University of Texas at Austin, the University of Texas at San Antonio, the University of Houston Clear Lake, and as an adjunct professor at Baylor University. He has numerous geological publications, and he led field trips to the Lower Cretaceous of Central Texas for geological societies and student organizations. Dave was dedicated to the Nature Conservancy projects in the Texas Hill Country. One of us (RWS) knew Dr. Amsbury because of his Cretaceous publications, which were based on his dissertation work and subsequent work for Shell. His publications demonstrated a keen and curious mind that sought accurate answers. 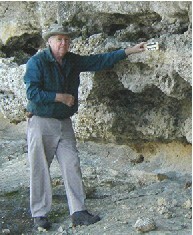 Following his retirement he prepared a comprehensive manuscript on Lower Cretaceous strata in central Texas. Although these rocks have been studied for many years, clearly Dave's insightful observations unraveled important relationships of this complex stratigraphy that would revolutionize our thinking. Since then, sharing field trips and discussions with Dave always drove me to a more complete understanding of both geologic relationships and, more importantly, geological questions. Dave's keen observations, his innovative associations of the data, and his penetrating questions were exciting and stimulating. We all miss Dave's joy of geologic fieldwork. Dr. David L. Amsbury passed away August 16, 2002. The week before, he accompanied one of us (WCW) to inspect some springs issuing from the basal Edwards limestone. He had planned to make his hospital stay as short as possible so he could get back to work on revising the diagrams for his paper in this volume. He was preoccupied with Lower Cretaceous carbonate rocks right up to the end.